Quest Nutrition Bars are fast becoming the most popular protein bar here at CSN and the world over! Quest has developed a bar that fills the holes in the market left by the other available protein bars, and they have done so without the need to use all of the filler ingredients so frequently found in others. Quest has used ONLY ingredients that an athlete would use, and a Quest Nutrition Bar is ahead of the game. 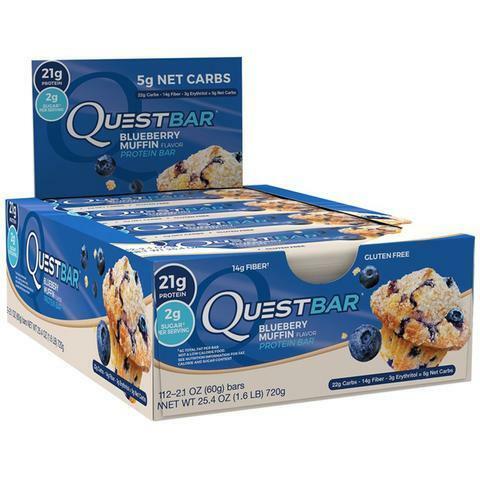 Quest Bars utilise the finest protein sources as well as being free from sugar alcohols! The nutritional profile of a Quest Nutrition Bar speaks for itself, with 20g of protein and 4g of non-fibre carbs you know you are getting a bar that is good for you! Usage : As a snack between meals or as a late night treat to curb carb cravings! Chocolate with Sweetener 23,6% (Cocoa Mass, Maltitol, Cocoa Butter, Milk Fat, Emulsifier (Soy Lecithin), Vanilla), Caramel Flavoured Layer 18,2% (Bulking Agent (Polydextrose), Soy Oil, Skimmed Milk Powder, Xylitol, Emulifier (Soy Lecithin), Salt Flavours), Gelatine Hydrolysed Wheat Gluten, Humectant (Glycerol), Milk Protein, Soy Protein, Soy Crisp 2.7% (Soy Protein, Low Fat Cocoa, Topioca Starch), Soy Oil, Cocoa Nibs, Flavours, Salt, Sweetener (Sucralose).